A friend of mine has been extolling the virtues of Matthew Pearl for quite some time, she ia a true fan and was always encouraging me to read his books. She just knew that I would enjoy them and she was right! The Technologists is a thriller about the very first class at the Massachusetts Institute of Technology (MIT) at a time when the idea of teaching science and technology was considered a danger to society. A series of scientific disasters spreads throughout Boston, and a small group of students from the class of 1868 come together to uncover the source of the menace. They form their own Secret Society known as – you guessed it – The Technologists. Included among the members of the Secret Society is Ellen Swallow, the very first female student at MIT who is hidden away from the public like a “dangerous animal.” The fight to discover the cause of the disasters soon becomes a fight for the very life of MIT. Matthew Pearl has made the seemingly uninteresting beginnings of one of the world’s premier educational institutions into a thriller worth reading. His incorporation of MIT’s William Barton Rogers and other historical figures makes the science and technology aspect of the novel interesting rather than a drag, which I must admit I feared! If you like historical fiction, this is a must read. 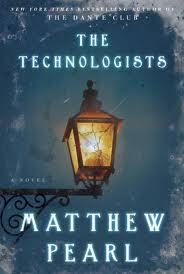 If you haven’t read Matthew Pearl, but like Caleb Carr and Stephanie Pintoff, pick up a copy of The Technologists soon. I received an Advanced Reader’s Edition of this book free from Random House. I was not required to write a positive review and the opinions I have expressed are my own. Book Details: Published by Random House (February 21, 2012), 496 pages, ISBN: 1400066573.